Fish again tonight. 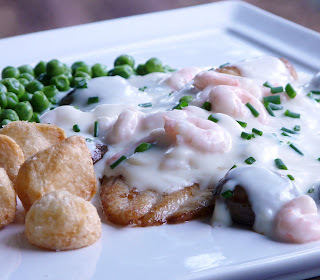 Sole served in a cream sauce with mushrooms and hand-peeled baby shrimp. This was a very easy dinner to put together. Dinner was served in less than 45 minutes after I got home from work. A simple Bechamel sauce seasoned with garlic, salt, pepper and just a little fresh grated Parmesan. The sole was sauted quickly in a little oil and butter. Sauted mushrooms and baby shrimp were added to the sauce at the last minute. I was thinking initially of making Duchesse potatoes but decided that Parisienne potatoes would be quicker. Always, always you are an inspiration.